Vitamin B12 is also known as cobalamine or cyanocobalamine, comprises a number of forms including cyano-, methyl-, deoxyadenosyl- and hydroxy-cobalamin. 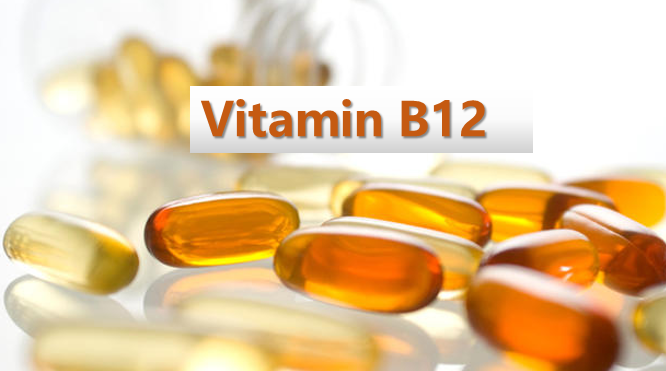 Vitamin B12 is a water-soluble vitamin that has a key role in the normal functioning of the brain and nervous system via the synthesis of myelin (myelinogenesis), and the formation of red blood cells. It is one of eight B vitamins. It is involved in the metabolism of every cell of the human body, especially affecting DNA synthesis, fatty acid and amino acid metabolism. Much is now known about the biochemistry and metabolism of vitamin B12, however, the diagnosis of its deficiency has become more complicated with the classification of a “sub-clinical” deficiency category, characterized by serum vitamin B12 concentrations that were once considered to be adequate. Vitamin B12 deficiency was previously thought to take many years to develop, and only in strict vegetarians or those with pernicious anaemia. More recent research has suggested that there are disease implications associated with sub-clinical B12 deficiency, which develop most commonly due to malabsorption or dietary inadequacy. The rates of sub-clinical deficiency of vitamin B12 are high in developing countries, in the elderly, and in vegetarian populations. The long term consequences are not fully known but may include adverse effects on pregnancy outcomes and aspects of ageing. Vitamin B12 deficiency is most commonly caused by low intakes, but can also result from malabsorption, certain intestinal disorders, low presence of binding proteins, and use of certain medications. Vitamin B12 is rare from plant sources, so vegetarians are more likely to suffer from vitamin B12 deficiency. Infants are at a higher risk of vitamin B12 deficiency if they were born to vegetarian mothers. The elderly who have diets with limited meat or animal products are vulnerable populations as well. Vitamin B12 deficiency may occur in between 40% to 80% of the vegetarian population who are not also consuming a vitamin B12 supplement. Elevated levels of serum B12 (cobalamin above about 600 pmol/L) in the absence of dietary supplementation or injections may be a diagnostic sign of serious disease. In such cases B12 is thought to be a marker for disease, not the causal agent. One cause of elevated cobalamin is general liver disease, since hepatic cytolysis releases B12, and the affected liver shows decreased cobalamin clearance. Thus, acute hepatitis, cirrhosis, hepatocellular carcinoma and metastatic liver disease can also be accompanied by an increase in circulating cobalamin. Heart and blood vessel disease-Vitamin B12, in combination with vitamin B6 and folate (vitamin B9), has been shown to control high levels of homocysteine in the blood. Elevated homocysteine might increase your risk of diseases of the heart and blood vessels (cardiovascular disease). Despite this benefit, there’s no evidence to show that vitamin B12 supplements prevent heart disease. Dementia-Vitamin B12 deficiency is associated with dementia and low cognitive function, but it’s not clear whether vitamin B12 supplements might help prevent or treat dementia. Athletic performance-Unless you have a vitamin B12 deficiency, there’s no evidence that vitamin B12 supplements will boost your energy or make you a better athlete.